1. To make this Galaktoboureko recipe, start by preparing the syrup. Into a small pan add the sugar, the water and lemon zest (and a cinammon stick) and bring to the boil. Let it simmer for about 5 minutes, until the sugar has dissolved; remove the pan from the stove, add the honey and stir. Leave the syrup aside to cool completely. 2. 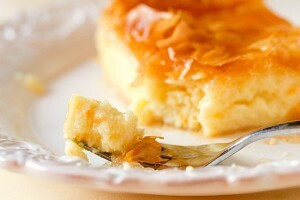 To prepare the custard for the Galaktoboureko (steps 2-7), divide the eggs into yolks and whites. In most traditional Greek recipes, the eggs are added whole towards the end, but with this Galaktoboureko recipe the eggs are beaten into meringues and combined in the semolina based cream. This is the secret to a more fluffy and creamy custard and to avoid the egg-y smell, which can ruin the flavour of your Galaktoboureko. 3. Place the egg whites and 50g sugar in a mixing bowl. Make sure your egg whites, bowl and whisk attachment/s are free of any water. Use an electric mixer or electric hand beaters to whisk the egg whites and sugar until the mixture is very thick and glossy, all the sugar has dissolved and a long trailing peak forms when the whisk is lifted (meringues). Set aside. 4. In another bowl, whisk the yolks and 50g of sugar, until the mixture is thick and foamy. This should take about 5 minutes. 5. With a spatula add 1/4 of the meringues into the egg yolks-sugar mixture and blend with light circular movement from the bottom up. Gradually add all the meringues into the mixture and blend. 6. Pour into a saucepan the milk, the milk cream and the rest of the sugar, and bring to the boil. As soon as it comes to the boil slowly add the semolina and the vanilla extract; turn the heat down to medium heat and whisk constantly until it the mixture becomes creamy. Remove the pan from the stove, add a knob of butter and blend. 7. Blend together the two mixtures, from step 5 and step 6 and set aside. Stir occasionally, to keep the custard from forming a skin on top, while you prepare the rest of the Galaktoboureko recipe. 8. For this Galaktoboureko recipe, you need a large baking tray, approx. 20x30cm. Melt 230g of butter, and butter the bottom and sides of the tray. Remove the phyllo roll from the plastic sleeve; you will use 5 sheets of phyllo for the bottom of the Galaktoboureko. Begin by layering the sheets one by one on the bottom of the tray, making sure to sprinkle each one thoroughly with melted butter. Layer four sheets of phyllo so that they extend half in the pan and half out of the pan horizontally and vertically and one more in the middle. Tip in the custard, smoothing the surface with a spatula and fold the phyllo sheet flaps over the custard. Add 4 sheets on top, sprinkling each sheet with melted butter. With a knife trim some of the excessive phyllo, if you like, and roll the rest on the edges. Brush the top with enough butter and scar the top of the Galaktoboureko with a sharp knife. 9. Bake in a preheated oven at 160C for 60 to 75 minutes until the phyllo is crisp and golden.